Use The Connection Credit Card as a GIFT CARD! Purchase a Connection Credit Card today and give it to a friend or loved one as a Gift Card! 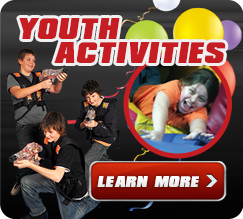 They can use it to discover all the fun of Bowling, Laser Tag, Arcade Games and Rides, Mini-Bowling, Inflatable Jump-N-Play Zone, Rock Climbing and Food From The Connection Café! Call us today at 704-583-1444 to purchase your gift card or fill out our Online Request Form! (Minimum $20 value for delivery) Or stop by our Ballantyne or Northlake facilities to purchase any value! Or Just A Gift For Yourself! Use your Connection Credit Card to pay for games, rides, food or any attraction at Sports Connection! (Ballantyne and Northlake locations). The Connection Credit Cards are FREE! Just add the dollar value to your card at any of our kiosks, recharge stations or front counters. No need to carry money or tokens around all day, attach your card to a lanyard or key chain for easy storage. Ticket value is AUTOMATICALLY added to your Connection Credit Card after you are done playing your game! Once you are done playing, go on a shopping spree at our Toy and Prize Redemption Counter. The Connection Credit Card is the Ultimate FUNDRAISING Tool! Fundraising is made easy at the Sports Connection with the Connection Credit Card. Your Group can sell the Connection Credit Cards at full price ($20) and your Group will make $5 on each card sold! The Connection Credit Cards can be redeemed at anytime at Sports Connection's Ballantyne and Northlake locations. You can even contact one of our Event Planners and see about having Sports Connection host your group on a weeknight to sell the cards and for all the friends and family of your group to enjoy their value! Contact us to discuss fundraising today!